"Termite" Armor - when you want that superstructure to last! This is the 'stuff' that started the craze. Developed by Peter Kunisch and named for hobby legend Charlie "Termite" Stephens (whose cannons were said to "chew through balsa" of opposing ships like termites), this armor is glued over the superstructure and provides a nice level of detail with just enough elasticity for complete bb-proofing! Just paint over the armor after it is glued in place and the worst that ever happens is little spots of paint flake off when hit and it needs a dab of paint to touch it up. You can see above how the different pieces of armor can be glued together over the base frame to create a beautiful and battle-lasting superstructure. 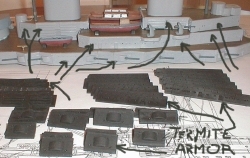 High Detail Cast SMS Baden/Bayern Casemates! Now cast in Battleship GREY! Our newest addition. Made specifically for refitting the SMS Baden and SMS Bayern German dreadnaughts to meet the Model Warship Combat fastgun club casemate rules. These casts are made with specific gaps at all the penetrable areas within 1/2" from gunwale per most combat model rules.